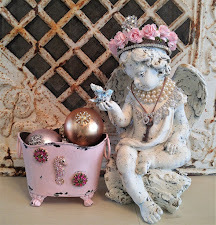 Link up with the Gypsy Fish Journal for "Silver Sunday!" Thank you for sharing your stunning silver pieces. Happy Silver Sunday. I had to laugh at Mr.Shakespeare's Tiara... I love it! Wanted to thank you for becoming a follower and for your visit to my blog... put you on my sidebar.. need to come back and read what your up to... thanks again! Thanks for leaving a comment on my blog and allowing me to discover yours! I LOVE all of your "stuff"! It never ceases to amaze me all of the creativity that is out there just waiting to be discovered!! Thanks for stopping in at Applejack Lane today. I see you love Christmas, too! We are having our Hallmark Ornament Premiere this weekend at our Hallmark shop. I meet a lot of people on this weekend that love Christmas as well. 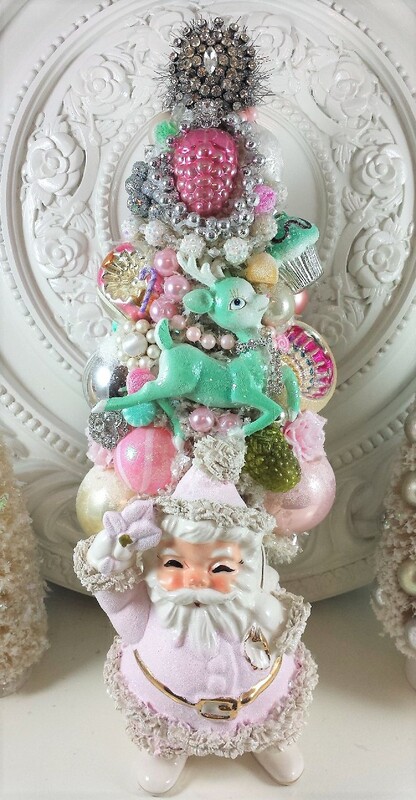 Are you starting any Christmas in July projects? I'll have to follow and see what is up! your silver pieces are gorgeous! love that monogrammed piece. What a charming blog you have! Love all your beautiful silver. 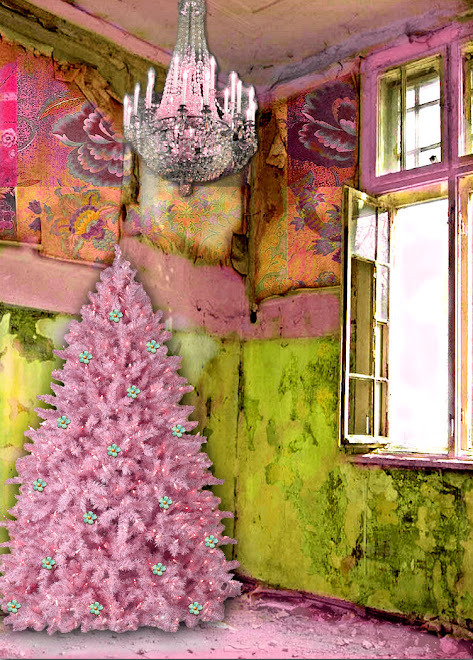 Scrolled down to read some other entries and the vintage Trees are so very pretty!! Thank you so much for coming by to see my arbor and saying "hi!" OH MY!! How gorgeous - drooling over your Silver today ~ only Shakespeare could pull off that tiara. Again, loving your music selections as well. Thanks of all of your kind words the other day on my blog. 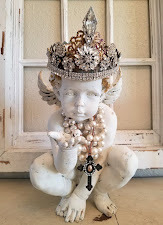 Glad you stopped by.. Have a great Sunday..
what a fun to see Shakespeare wearing a tiara. You displayed beautifull silver items. I love those little souvenir spoons. Lots of people in Germany collected such. Thank you so much for sharing your treasures. They make a pretty vignette. 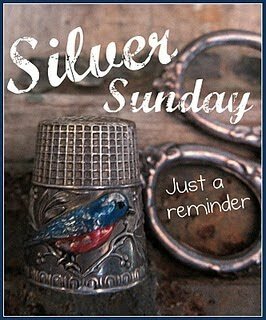 Beautiful Silver Sunday Post & to top it off, Shakespeare in a Tiara is the Perfect Touch! 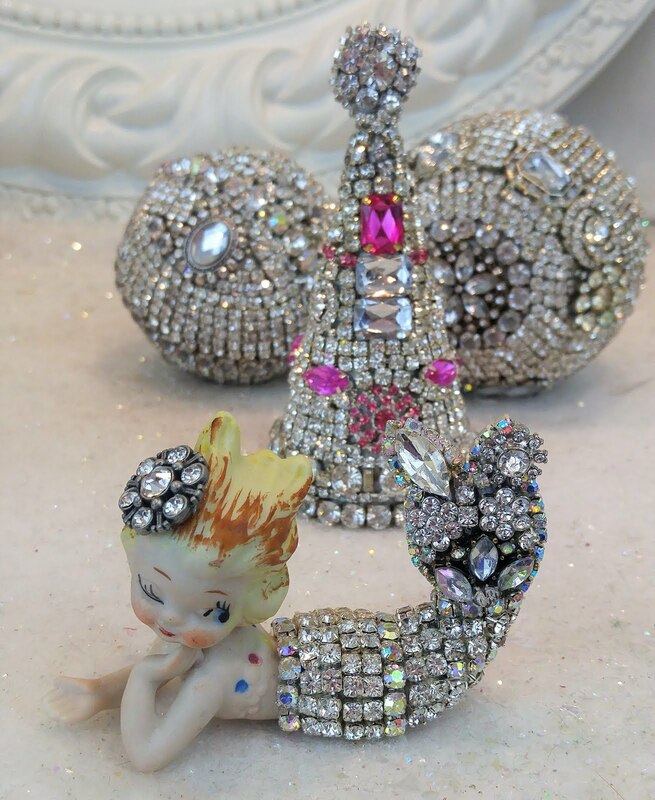 What beautiful silvers you have- I especially loveWilly in the Tiara! 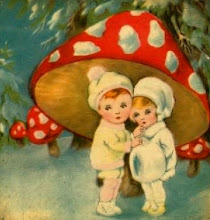 Thanks for stopping by our little forest and for your kind comments! Love all you silver goodies! I cracked up at Shakespeare & his tiara...you have a very strange sense of humor & I love it! I also love all your pretty bling! 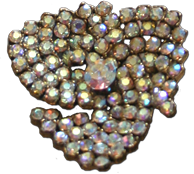 What beautiful vintage silverness!! Love the tiara!! I am a huge fan of silver... especially vintage and monogrammed! The cup with the silver flatware is so beautiful! I love that you have displayed it that way. fab pieces of silver! love the tiara! Thanks for stopping by and saying hi. Oh, I so love silver...and I see we are sorority sisters. So nice to meet you...your art is fantastic! What a beautiful and fun blog you have. So nice to meet you. Your silver is beautiful and I had just visited Stone Gables. I need to begin collecting. Your displays were charming and fun. Thanks. I just found your blog through Silver Sunday. I have admired your bottle brush trees many times on Ebay. Love this blog. 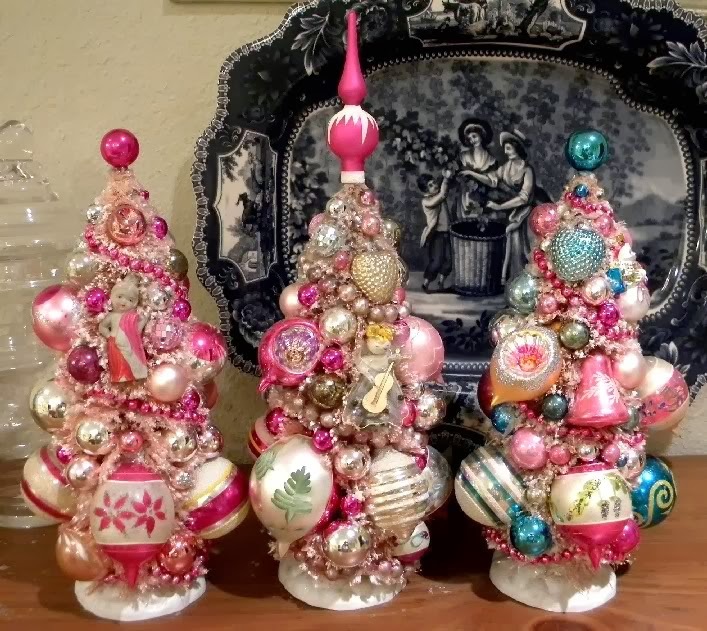 It's a little early for me to think about Xmas but this is totally my Xmas style. I just started following so that I can see all your pretty things. Love that tiara~Have a great week! Shakespeare in a tiara, of course, why didn't I think of that, what fun, Susanne. 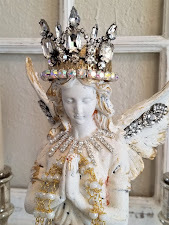 Thank you for stopping by the Bliss Guild Blog and leaving a comment. 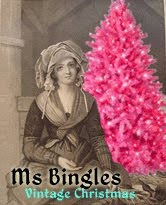 I had to check out your blog--and found it to be a lovely place to sit a spell. I did giggle at Shakespeare's tiara. You have a wonderful display of silver. The tiarra is a hoot! What is the beautiful piece of silver sitting in front of the bust? It is so unique. Thanks for visiting my blog and leaving me a sweet comment. I love your silver collection! I can never get enough of it myself. How cute is Shakespeare in his tiara!!! And he is surrounded by some gorgeous silver pieces. 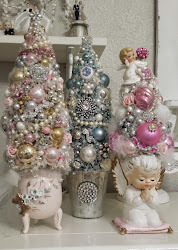 I love love love your vintage bottle brush tree creations! I use to be into the Gold, but now I'm leaning more towards the tarnished silver.... Your silver pieces look great. 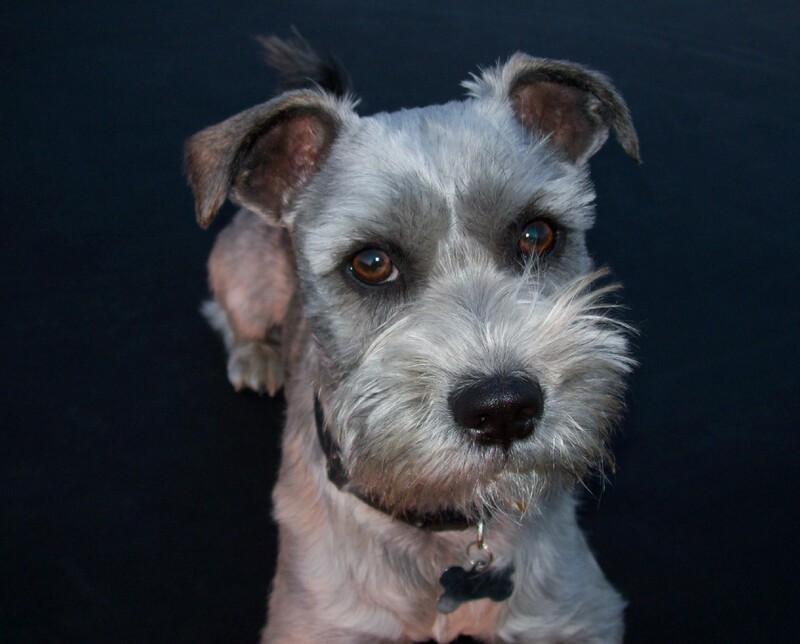 I was browsing through your blog and seen little Bob on the bottom of the page.... What a cutie pie he is! Thanks for dropping by- it is so nice to meet other new bloggers. I just popped over to say "hi" and hope you are doing great!!! What beautiful silver pieces and I am still astounded by your gorgeous altered art piece...you amaze me! Thank you for your sweet comment on my blog! I just love Shakespeare's tiara, that is too funny! 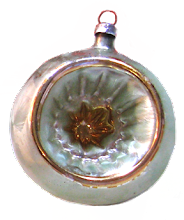 You have some amazing silver pieces. At least this even gave me reason to get my tabletop dusted off! Your silver pieces are just gorgeous, Leticia! Thank you for sharing! 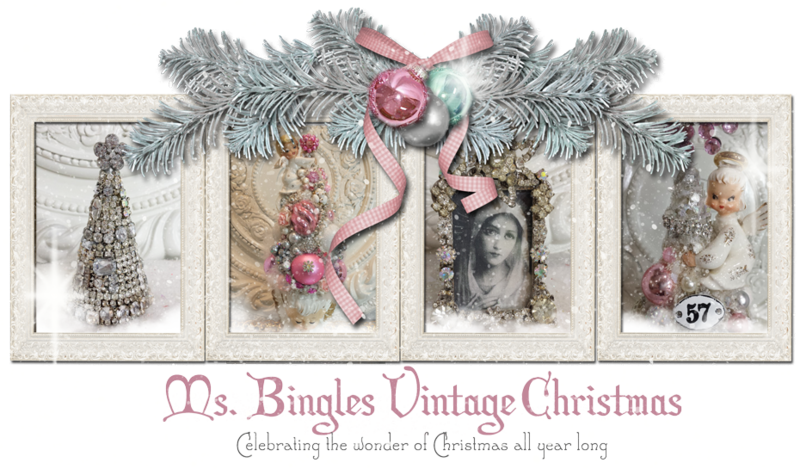 Ms Bingles Vintage Christmas "Big 100" GIVEAWAY! Oh My Gosh, I Won! YEA~! For Cindy at "I Owe it All to Him"
The "French Larkspur" is having a Giveaway~! A toast to the "French Inspired" linking party~! 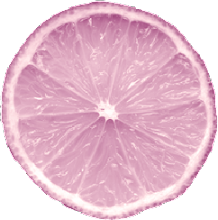 Its a "PINK GIVE AWAY"